Hi, I’m Rob, a Multi-Award winning Liverpool wedding photographer, I photograph weddings all over Liverpool, Cheshire and the North West. I photograph weddings in a natural and unintrusive style often called reportage, storytelling, journalistic and candid. I’m also known for my stylish and striking couples pictures. Although I primarily photograph weddings in the UK around Liverpool, Manchester, Cheshire, I’m also happy to work anywhere in the world. I consider myself lucky to be a wedding photographer and making my living doing something I genuinely enjoy. Weddings are great fun to photograph because I get to meet so many lovely people and there is always something happening. I love capturing your wedding day in beautifully composed and perfectly exposed images. Wedding pictures filled with genuine moments of fun and emotion. I promise amazing wedding pictures and an equally amazing experience with my service too. Love my work? I'd love to hear from you! Over the years, I have received many different awards for my wedding photography. These awards tell me that my couples love their photographs and the way I work. It’s your guarantee of great wedding photos and a quality service from start to finish. Pleased to have been recognised this year in the UK Enterprise Awards for wedding photographer of the year. Over to moon to have won ‘Best profession wedding photographer, North West’ at this year’s Global Entertainment Awards. I’m delighted to have been crowned, ‘North West Wedding Photographer of the Year’ for the second consecutive year at this year’s English Wedding Awards. There are literally thousands of wedding photographers in the North West so competition is strong, this is a huge achievement and one I’m immensely proud of. Thankyou for the photos, we love them. Thanks again for your work on the day and afterwards, you captured something of everyone and they will be a great memory of the day, especially for Ben after all that champagne! Thanks Rob these are all absolutely amazing!! Thanks so much for spending the day with us and we are really pleased with all these - particularly the ones of eric during the ceremony! Thanks so much for an absolutely amazing set of wedding photos!! We both love them so much and think they have really captured our day perfectly and take us right back to the wonderful day we had!! So what is documentary wedding photography? In a nutshell, documentary wedding photography is telling the story of your wedding in beautifully composed and perfectly timed images. Genuine images of things that happened rather than fake moments made up by your photographer. It means you get to enjoy your day, your way without your photographer being in the way, in fact, most of my couples don’t even notice me. Documentary photography isn’t just about recording great moments though. For me, it has to be so much more. Great moments are very important you need the first kiss for example, but on their own moments are just snaps. With strong composition, great timing and technical perfection those moments are transformed from just snaps into stunning images that take you right back. In short, your photographs will tell the stories of your day and take you right back to the very essence of your wedding day and that’s a powerful thing. My pictures have are described as many things, contemporary, classic, timeless, stunning and beautiful. Documentary wedding photography is also known as reportage, photojournalistic and candid photography. It’s the best way to get amazing wedding pictures without having to spend hours posing, in fact, you don’t need to give your wedding photography a second thought – just leave it to me. Thornton Manor Weddings are beautiful whatever the weather, I got married here myself in 2009! I’m proud to be associated with TWIA (The Wedding Industry Awards) as part of the judging team for the past four consecutive years. Judging the wedding photography category is something I both enjoy and take very seriously. It takes a lot of time and effort looking at literally 100’s of websites in search of each year’s winners. I have also been featured on ‘Made in Liverpool‘ TV. I was interviewed by Emily Bonner about winning the North-West Wedding Photographer of the Year title and being a Liverpool wedding photographer. My wedding photography has also been featured on ‘Love my Dress‘, wedding blog. For the past three years, I have been a judge for ‘the wedding industry awards‘ (TWIA). I also run photography training workshops for Fujiholics to help other wedding photographers improve their photography and business skills. My work has been featured in several wedding and bride magazines, professional photographer magazine and other photography publications. These awards and industry recognition are great to receive. However, what matters most to me it what my couples think. The fact I see so many of them again and again because they’ve recommended me to their friends is the biggest endorsement of my service I could wish for. Although based in Liverpool, EasyWeddings have named as one of the top 10 Wedding Photographers if you are planning your wedding in Cumbria! I love Cumbria and always happy to travel there to photograph weddings. If you are looking for Liverpool wedding photographers, I’d love to hear from you. You can contact me by phone 07775 503659. Email weddings@robsandersonphotography.co.uk or by using the contact form here. As Liverpool wedding photographer I naturally photograph weddings all over Liverpool, Southport and the rest of Merseyside. 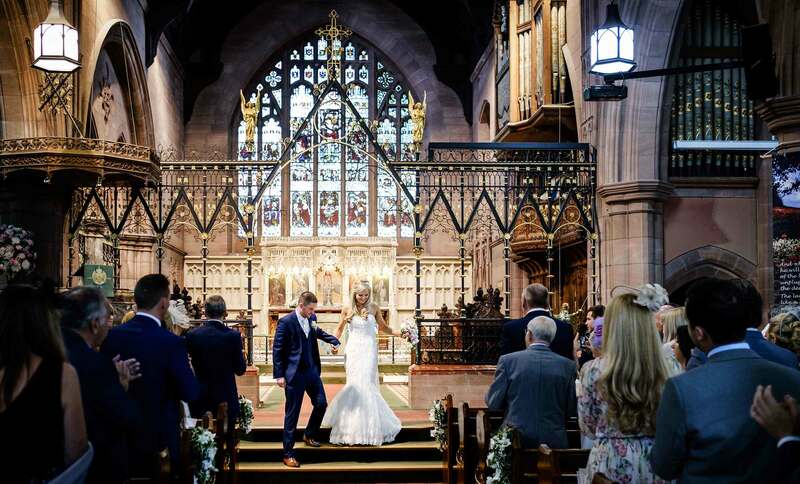 Most of the weddings I photograph are in Cheshire. Cheshire has so many fabulous wedding venues it’s great to be a Cheshire wedding photographer too. Although based in Liverpool I photograph weddings all over the UK and Europe. This page is about Liverpool wedding photography. Follow this link if you are looking for Manchester wedding photographers. Sefton Palm House is another of this Liverpool wedding photographers favourites. Wedding photography here is different with each season. I’ve worked as a Liverpool wedding photographer for over a decade. Therefore, I have worked at most of the best venues in Liverpool, Cheshire, Manchester and the North West. I’ve written a series of useful guides about many of these venues. These guides are based on my experiences photographing weddings at each venue. My guides are hopefully full of interesting facts and useful information. I hope you find these valuable.